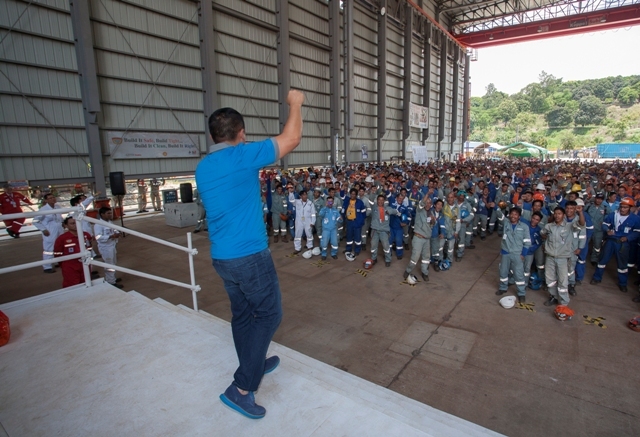 In its second year, the Barangay KAPIS Fiesta once again gathered the Topside and Substructure team at Keppel Subic Shipyard last May 15-16, 2014. KAPIS stands for Kaligtasan sa Puso at Isipan (Safety in Hearts and Minds) and is Malampaya Phase 3 (MP3)’s version of a safety club. In this two-day event, members are invited to be part of Brgy KAPIS where the vision of proactive intervention and emphasis on the importance of team effort and safety in the workplace are realised. Keppel Project Director Leong Kok Weng (leftmost) receives the award for achieving 5 Million Man Hours LTI-Free in MP3 from (right to left) MP2 and 3 Project Manager Antoine Bliek and MP3 Company Site Representative Nathan Stephenson. HSSE Engineer Jet De los Santos imparts his special message to the team. Malampaya Phase 2 and 3 Project Manager Antoine Bliek, MP3 Company Site Representative Nathan Stephenson, and HSSE Engineer Jet De los Santos imparted special messages to the team that focused on looking after the safety of one’s peers, significance of quality and productivity, and most importantly the value and importance of being a Brgy. KAPIS member. One of the major highlights of the event was the awarding of the 5 Million Man Hours LTI-Free Achievement of the MP3 Fabrication Team which was presented to Leong Kok Weng, Keppel Project Director. 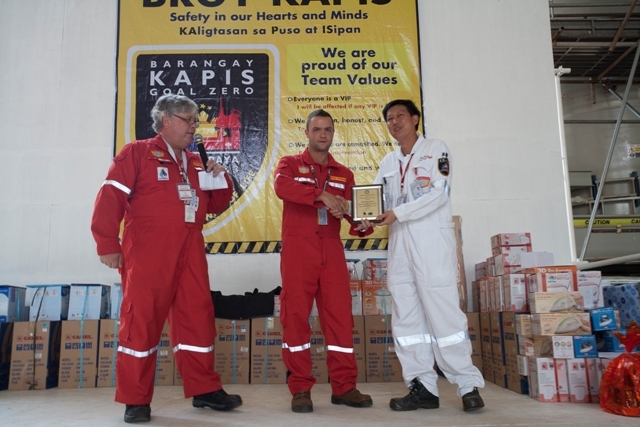 Other noteworthy recognitions such as Best Safety Observation Card, Best Take 5 and Best KAPIS Champions were also awarded. Fitness coaches Jim and Toni Saret inspire the participants to always work together and with discipline. Celebrity fitness coaches from Biggest Loser Philippines, Jim and Toni Saret, shared the secret to their success and inspired the first batch who attended the event which composed of 800 participants. They highlighted the importance of teamwork and discipline in achieving a common goal. They also emphasised the importance of having a healthy lifestyle and being fit to work. “In everything we do, we try our best to remember that we are doing it to bring change in the world and for others. It is just similar to what you are doing for the Malampaya Phase 3 Project,” said Jim. Philippine National Basketball Team Gilas Pilipinas’ Head Coach Chot Reyes reveals the keys to having a great team. Brgy. KAPIS team takes pictures with Coach Chot Reyes. For the second batch, the Philippine National Basketball Team Gilas Pilipinas’ Head Coach Chot Reyes revealed the keys to having a great TEAM (Teamwork, Effort, Ability, and Motivation). He shared, “We (Gilas Pilipinas) have experienced a lot of challenges, but it is through teamwork and “puso” (heart/love) for what we do that helped us become victorious.” The event ended with the participants pledging to reaffirm their commitment to Brgy Kapis that served as a pact to the club’s values of conformity to team effort, treating everyone as a VIP and having true passion for safety.